Dr. Smith has years of experience placing dental implants and loves providing this procedure. 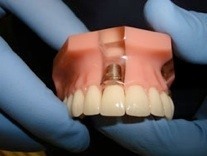 Most patients are surprised by how quickly dental implants can be placed. You will be numb and comfortable during the entire procedure. People of all ages get dental implants to replace missing or damaged teeth. It’s important to understand that getting a dental implant requires two steps. 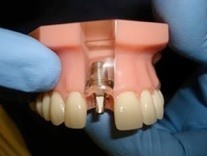 First the implant is placed and then the tooth (or teeth) will be placed over the implant. The doctors at Dentistry With TLC are trained to provide both services so you are not required to see a different dentist for part of the procedure. At Dentistry With TLC we make getting implants as convenient as possible. Not all dentists place dental implants. When considering dental implants, you should discuss your options first with a qualified dentist, like Dr. Smith, with experience in implant dentistry. Implant dentistry is relatively safe for most people, though some areas of the mouth require more skill than others. Replacing a missing front tooth with an implant.